Politicians promoting “Immigration Reform” are trying to sell us the idea that limited rights for the “good immigrants” can be won in exchange for increased repression of all others. Join us for a forum about grassroots struggles to confront criminalization and resist borders without buying into the politics of “worthy” vs “unworthy” people, “good immigrants” vs “criminals” and so on. ***** 6:00 – 8:00 PM Next Steps Dinner, Gompers Park (Foster and Pulaski) – rain site is Centro Autonomo, we regret this rain site is not accessible. Join us to wrap up the forum and talk about next steps, connect more deeply and explore concrete ways to build together. Dinner offered by Food not Bombs Pilsen. 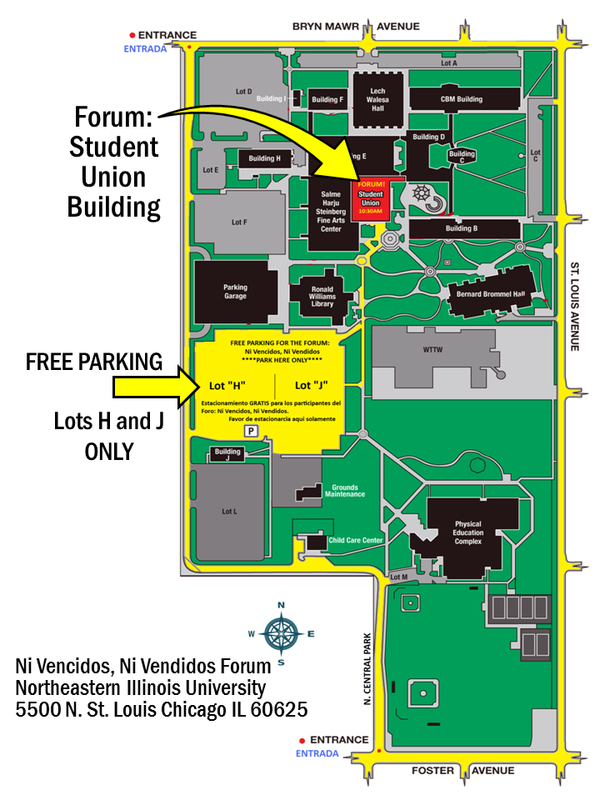 Sábado 7 de Septiembre, 10:30 AM-5:00 PM en el Campus de la Universidad Northeastern de Illinois (NEIU). Registración, Inmigración a través del Tiempo, Ejercicio sobre el complejo industrial de las prisiones (PIC), Introducciones, y ¡Cafecito caliente Y aperitivos! 1:00 PM: Taller: · Hip Hop es Resistencia: Un taller interactivo sobre creando ritmos de hip-hop revolucionarios con Grupo Shining Soul desde Phoenix Arizona. · ¿Qué onda con eso de la Reforma Migratoria?